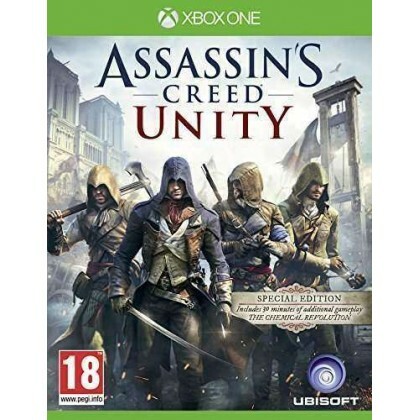 Introducing Assassin's Creed Unity, the blockbuster franchise's new chapter powered by the all new Anvil engine, rebuilt from the ground up for next gen. From the storming of the Bastille to the execution of King Louis XVI, experience the French Revolution as never before, and help the people of France carve an entirely new destiny. A ruthless new hero for a brutal world: Play as Arno, an entirely new breed of assassin, more lethal than his ancestors. Take down your prey with a range of new weapons such as the Phantom Blade, a Hidden Blade with crossbow capabilities. Brand new parkour, combat, and stealth gameplay: Enjoy an unprecedented degree of freedom and control over your assassin, brought to life by the new Anvil engine. Enhanced stealth gameplay including new stealth mode, cover system, and crowd manipulation techniques. Stay hidden, stalk your prey, and strike without warning. Deep customisation mechanics to craft your own Master Assassin: Craft your own unique play style by choosing your weapons, gear, outfit, and specialised skills. Mix and match from hundreds of possible combinations and build your stealth, fighting, and navigation abilities from a new expansive skill tree. Become the ultimate Master Assassin. Discover revolutionary Paris, brought to life as never before: Carve your way through a stunning full scale open world city, a feat only possible through the power of the new Anvil engine. Embark on ancestral missions, treasure hunts, murder mysteries, contracts, and more. The city is packed full of activities that will captivate you for hours. Witness the chaos of the French Revolution first hand by immersing yourself in realistic, systemic crowds of up to 5,000 AI-driven characters. A unique co-op experience you must play to believe: In addition to an epic singe-player campaign, join up to three friends and experience the online open world of 18th century Paris. Pull off ambitious heists and take part in unique narrative-driven missions designed exclusively for cooperative play. Sabotage an execution. Protect an emperor. Assassinate a Templar agent. But victory won't be easy; you and your lethal band must rely on communication, coordination, and diverse skills to accomplish your missions, then vanish into the shadows. The Special Edition includes the additional single-player mission "The Chemical Revolution", providing an extra 30 minutes of gameplay. Antoine Laurent de Lavoisier is considered to be the father of modern chemistry. As a result of his efforts, he was able to create the formula for a poison bomb. Unfortunately he was taken before he could give it to you. Help him escape his kidnappers and recover the formula of the precious bomb.